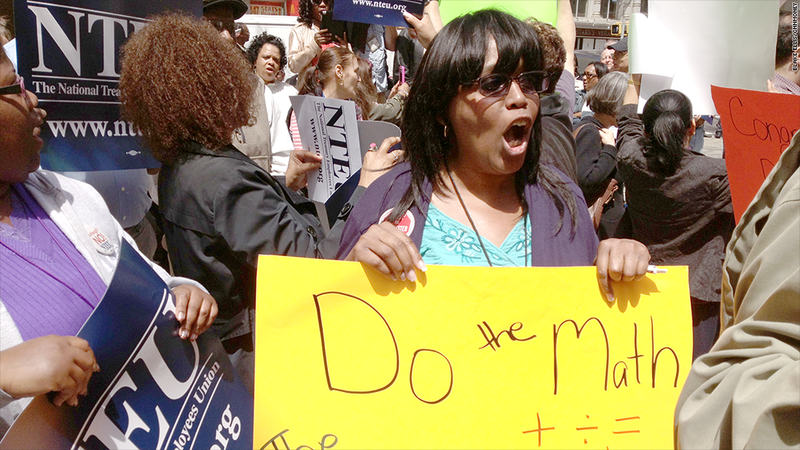 IRS workers rallied against government spending cuts on Tuesday. Click on the image to view more protestors. "Hey, hey, ho, ho, sequestration has got to go," IRS workers chanted at a rally in downtown Manhattan this week, waving neon-colored signs protesting government spending cuts and impending furloughs. Known as the sequester, the cuts will wipe $600 million from the IRS's budget this year, forcing the agency's nearly 100,000 employees to be furloughed without pay for up to seven days. The furlough days will begin May 24 and will be spread out among separate pay periods. The National Treasury Employees Union, which organized Tuesday's rally, said the IRS brings in 93% of the revenue used to fund the federal government and $1 invested in the IRS brings a $7 return from collections, so shutting operations down for five days will only serve to reduce revenue and boost the deficit. To send a message to Congress, NTEU has been holding protests across the country. Tuesday's rally was the biggest so far, with hundreds of workers in attendance. Not only will these furloughs impact taxpayers, who will likely see long wait times for assistance and fewer audits, but IRS employees are worried about the financial hit they'll take without a full week of pay. Cheryl Lassiter, who has worked as an IRS auditor in New York for 33 years, is single and cares for her elderly mother in North Carolina who is struggling through terminal cancer. "I live paycheck-to-paycheck, so if something comes up I really hope I have [the money]," said 53-year-old Lassiter. "I was going down to see [my mother] for Memorial Day, but I did a budget analysis and decided not to go because I better save my money." If money gets really tight, she said she would consider getting a second job in retail. Overall, IRS employees will lose about $160 to $400 per day, depending on their position, estimates John Kelshaw, a tax appeals officer at the IRS and president of the New Jersey NTEU chapter. Another auditor, Edward Filistowicz, said he switched to a cheaper cell phone plan, is cutting back on spending and putting more into savings in order to prepare for the five days without pay. He also plans to spend those days calling Congress and telling them to get their act together. Peter Dinicola, who has worked at the IRS for 10 years as a contract specialist, is also bracing for the cut. "My mortgage payment is half a month's salary, so I'll have to dig into savings," said Dinicola. The furloughs just compound the financial issues for federal employees who are facing pay freezes for the third year in a row, and many also worry that a shrinking budget will also lead the IRS to eliminate its performance bonuses. Catherine Ficco, an auditor who has worked at the IRS for 23 years, said she plans to send her 13-year-old twins to a less expensive summer camp this year because she won't have the means to afford the more expensive camp they have attended for the past seven years. Sharyn Phillips, an estate and gift tax auditor who is supporting her ill husband who retired five years ago, isn't even sure how hard the furloughs will hit her yet. "I've never experienced a time when I wasn't working, so I've never had to budget in a no-pay day," said Phillips. "I've already had a pay freeze for three years and now with five days of furloughs, it just makes things more difficult. And expenses only go up -- my bills don't shut down."